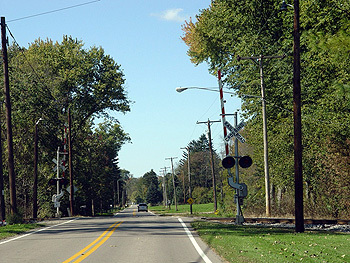 The National Scenic Byways Program of the U.S. Department of Transportation, Federal Highway Administration, has been in full swing with 309 projects in 45 States chosen in 2006 to receive $25.5 million in grants. The program, established in 1991, has provided funding for 2181 State and nationally designated byway projects in 50 States, Puerto Rico and the District of Columbia. A road is chosen as a Scenic Byway for not only its scenic beauty but also its historic, cultural, recreational, and/or archaeological importance and its natural qualities. Scenic Byway going into the historic town of Medway, Ohio. 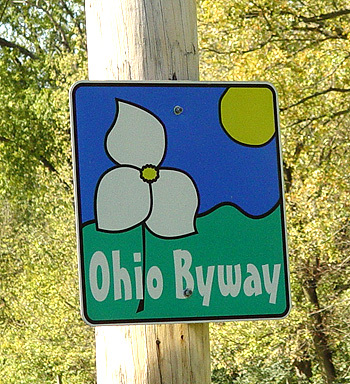 In May of 2004, the historic Lower Valley Pike, Route 316-south of Springfield, OH in Clark County-met all these qualifications and was named Ohio’s 18th State Scenic Byway. Near the Mad River and National Road, the Byway winds through limestone cliffs, wet woodlands, and rich farmland. It leads to the historic town of Medway where some of the State’s oldest buildings still stand. Outside of the town horses and cattle enjoy rich meadows. In October 2004, the official dedication and reception celebrating the announcement of the State Scenic Byway was held at a local Medway business, followed by a ribbon cutting in the Medway Town Park. The Byway also leads to the rolling hills of historic George Rogers Clark Park and the meadowland site of The Battle of Piqua that took place on August 8, 1780. This was one of the last battles-and the largest-in the west during the Revolutionary War. General Clark, for whom the county is named, led his Kentucky soldiers to victory and is said to be the only General who was never defeated in battle. A historic marker for the battle and a memorial to the Shawnee who were driven from their lands stands on the site today. The road is named for the great Shawnee leader, Tecumseh, who was born nearby, possibly in the village of Piqua. 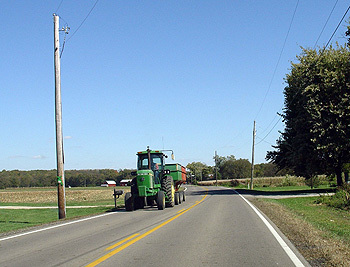 Farm equipment traveling the Scenic Byway. 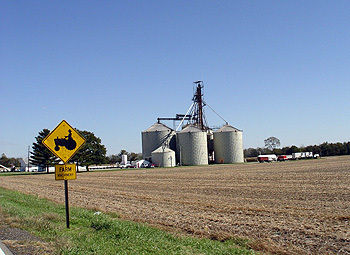 A farm as seen while traveling the Scenic Byway. The Byway offers fishing in the Mad River, access to tourist attractions such as the Estel Wenrick Wetlands and the Davidson Interpretive Center, and seasonal events like the New Boston Fair and Native American powwows. Without a doubt, the National Scenic Byways Program brings tourism and revenue into little known areas like those on the Lower Valley Pike for all to enjoy.